I have previously discussed Great Britain's unprecedented escape from the Malthusian trap. Such escapes require virtuous cycles, i.e. positive feedback loops that allow productive capital to accumulate faster than it is destroyed. There are a number of these in Britain in the era of escape from the Black Plague to the 19th century, but two of the biggest involved transportation. One of these that I've identified was the fodder/horse/coal/lime cycle. More and better fodder led to more and stronger horses, which hauled (among other things) coal from the mines, initially little more than quarries, that had started opening up in northeastern England by the 13th century. 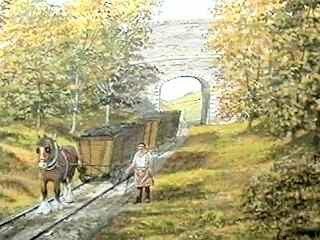 Coal, like wood, was very costly to transport by land, but relatively cheap to ship by sea or navigable river. As fodder improved, horses came to replace oxen in the expensive step transporting goods, including coal, from mine, farm, or workshop to port and from port to site of consumption. Many other regions (e.g. in Belgium and China) had readily accessible coal, but none developed this virtuous cycle so extensively and early. Among the early uses of coal was for heating, fuel for certain industrial processes that required heat (e.g. in brewing beer), and, most interestingly, for burning lime. Burned lime, slaked with water, could unlike the limestone it came from be easily ground into a fine powder. This great increase in the surface area of this chemical base, which let it de-acidify the soils on which it was applied. The soils of Britain tend to be rather acidic, which allows poisonous minerals, such as aluminum, to absorb into plants and blocks the absorption of needed nutrients (especially NPK -- nitrogen, phosphorous, and potassium). The application of lime thus increased the productivity of fields for growing both food and fodder, completing the virtuous cycle. This cycle operated most strongly during the period of the consistent progress in the English Malthusian isocline from the 15th through 19th centuries. Another, related, but even more important cycle was the horse/transport and institutions/markets/specialization cycle. 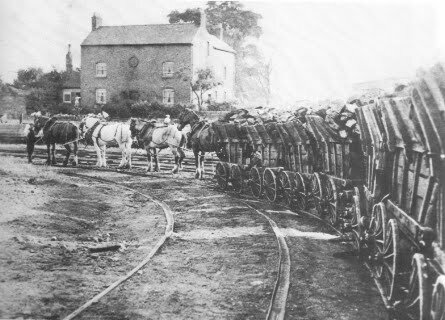 More and better horses improved the transport of goods generally, including agricultural goods. John Langdon  estimates that a team of horses could transport a wagon of goods twice as fast as a team of oxen, which suggests a factor of four increase in market area. Add to this the Western European innovations in sailing during the 15th century (especially the trading vessels and colliers that added lateen sails(s) to the traditional square sails, allowing them to sail closer into the wind), and market regions in much of Western Europe and especially Great Britain were greatly expanded in the 15th and 16th centuries. Expanded markets in turn allowed a great elaboration of the division of labor. Adam Smith famously described how division of labor and specialization greatly improved the productivity of industry, but to some extent this also operated in British agriculture. Eric Kerridge  eloquently described the agricultural regions of Britain, each specializing in different crops and breeds of livestock. Some were even named after their most famous specializations: "Butter Country", "Cheese Country", "Cheshire Cheese Country", "Saltings Country", etc. These undoubtedly emerged during the 15th through 19th centuries, as prior to that time European agriculture had been dominated by largely self-sufficient manors. And closing the cycle, there emerged several localities that specialized in breeding a variety of horses. Most spectacularly different British regions during this period bred no less than three kinds of large draft horses: the Shire Horse, the Suffolk Punch (in that eastern English county) and the Clydesdale (in that Scottish county). Institutions such as advertising and commercial law emerged or evolved to allow lower transaction cost dealings between strangers. This was probably by far the most non-obvious and difficult aspect of the problem of expanding markets. Greatly aiding in this evolution was the growth of literacy due to spread in Europe of the inexpensive books produced by printing especially in the 16th and later centuries. Where in the Middle Ages literacy had been the privilege of a religious elite, with very few on a manor literate beyond the steward, after the 15th century an ever increasing population could read advertisements, order goods remotely, read and even draft contracts. Another effect of longer-distance transportation was to open up more remote lands, which had been too marginal to support self-sufficient agricultural, to reclamation for use in specialized, trade-dependent agriculture. The ability to lime soils that were otherwise too acidic also often contributed to reclamation. There were many other improvements to English agriculture and transportation during these crucial centuries, but the above cycles were probably the most important up to the 19th century. Here I'll mention three important transportation improvements later in this period that in many ways show the culmination of the underlying trend: the development of the turnpike (private toll) roads in the 18th century and the associated development of scheduled transportation services, (2) a great expansion in the use of horse-drawn rail cars in coal and other mines, and (3) the development of river navigations largely in the 17th and 18th centuries, and canals largely in the 18th and early 19th centuries, again almost entirely through private investment and ownership. In the late 18th century the smelting of iron using coal instead of wood was perfected. 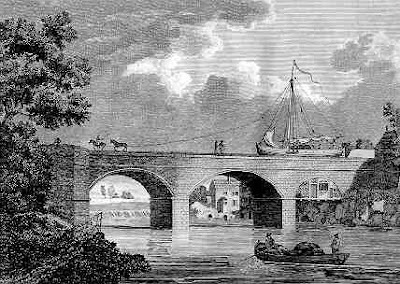 Soon thereafter iron became cheap enough to use for constructing bridges and aqueducts. One result was the spectacular Pontcysyllte Aqueduct in Wales. What in the early 19th century was a towpath for horses is now a sidewalk for tourists. Careful, it's a long way down!